Are you thinking of a gift item for your special someone? Admit it; sometimes, choosing the perfect gift can get overwhelming, especially since there are hundreds of gift items available in stores. Then again, you also don’t want to give a lame gift. Flowers, teddy bears, and clothes can be too predictive as well. If there is anything that is a unique gift idea, it is the Willow Tree You and Me Sculpted Figurine. It has all the features that you are looking for in a gift—stylish, personal, and sentimental. It is not a predictable gift item, and for sure, your loved one doesn’t have it yet. To what extent does the Willow Tree You and Me Sculpted Figurine become the best gift idea? This article enumerates the reasons, as well as the features, advantages, and minor drawbacks, if any, of the Willow Tree You and Me Sculpted Figure. There is no single perfect gift item for a special someone. It depends on your relationship, how you would like to express your affection, and the stuff that your loved one wants. This is the reason why there are various gift ideas being offered by different shops. The Willow Tree is a brand that offers figurative sculptures that convey different messages for healing, love, comfort, inspiration, and protection. Each sculpture is personalized and communicates emotions or messages towards a loved one. Over the years, Susan Lordi has been in partnership with the manufacturer to create, market, and distribute various sculptured figurines. She has been passionate about creating and hand-painting sculptures for years. In fact, she has been in partnership with DEMDACO and Willow Tree since 1999. The Willow Tree You and Me Sculpted Figure is a lovely, handcrafted gift item that sends an affectionate message towards someone. It is made by a well-known handcrafter in Kansas City, MO. The You and Me Sculpted Figure is one of the best products of the Willow Tree and sculpture expert Susan Lordi. What does it offer? Simple: a unique and sincere way of expressing the message of devotion, inspiration, protection, and affection. It is specifically intended for special, romantic love. The Willow Tree You and Me Sculpted Figure is a seven-inch resin figure hand-painted with light colors. It is a cast from one of Susan Lordi’s original and a part of other figurines that make up a Family Grouping set. The sculpture is a woman hugging a man with one hand holding his hand and her other hand on his shoulders. Their body figures reveal their expression. The tilted head, hand placements, and the turn of the body are all symbolically created to send the affectionate message. It is open to an interpretation from the receiver and giver, which make it a perfect choice. The sculptured figurine itself is easy to clean. You can remove dust and other unwanted elements using a soft brush and cloth. Avoid cleaning it with water or cleaning solutions as they can damage the painting or deteriorate its quality. The Willow Tree You and Me Sculpted Figurine is not an ordinary gift item. Its appearance is not cheap. It is a personalized, handcrafted item that is crafted with utmost attention to detail and fiery passion. Although it is not an as fancy and as elegant as a diamond ring or gold bracelet, it is simple and can be placed as a centerpiece on a table to remind your loved one of the message you want him or her to remember. As a gift item, the Willow Tree You and Me Sculpted Figurine comes in a beautiful box. Inside the packaging is a gift card written with a piece title and sentiment. It can be readily given as a gift. You don’t have to buy separate packaging unless you want to. Obviously, this sculptured figurine is not intended to be placed outdoors. It must not get in contact with water and other solvents to protect its quality and colors. The Willow Tree You and Me Sculpted Figure is not durable enough for accidental drops. However, it has enough weight so it won’t easily tip over and fall. The Willow Tree You and Me Sculpted Figurine is a medium-sized figurine that can be placed on top of a table, cabinet, or closet. Although it is made of resin, it is not a poor-looking gift item. Every part is handcrafted in detail, and the paint is soft and light. The details work harmoniously with each other, which suggests an effort at some branding and identity. In general, the Willow Tree You and Me Sculpted Figure has a clean, bright look that other kinds of figurines do not have. As a gift item made of resin, it feels warm and gives a sense of nature. It is also an environment-friendly gift item that has a homey feel. 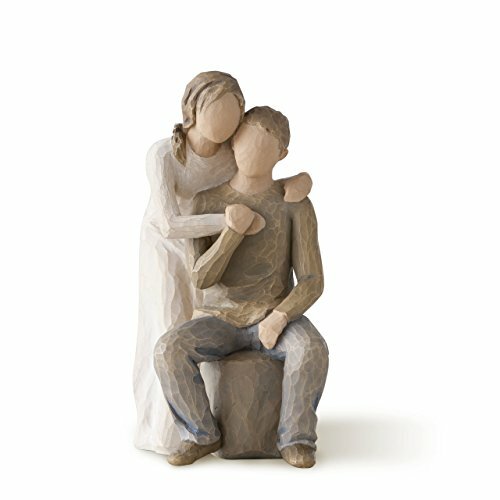 One of the most unique, sentimental gifts available today is the Willow Tree You and Me Sculpted Figurine, which features a light-painted sculpture of a man and a woman holding each other. However, if you think that this is not something you want to give your significant other, then we’ve got another option for you—the You Give Me Butterflies Figurine by Precious Moments. This product features a couple sharing a quiet moment together as a butterfly rests upon the girl’s hand, making them both feel the love stir within. This figurine is sculpted from fine bisque porcelain. To ensure the best quality, it is also hand-painted with lively colors. What makes the You Give Me Butterflies Figurine unique is that it can be used as a home décor to add color and life to any corner of your room or your lover’s. It can remind you of the feeling of butterflies in your stomach when you first started seeing each other. With abovementioned information review of the Willow Tree You and Me Sculpted Figurine, it’s hard not to consider it as a gift item for your loved one. It is unique and has a personalized touch on it to convey the message of affection and passion. Although it has a few imperfections, its features and characteristics make it a meaningful gift for anyone.